CA$H Mob at Kemper’s This Weekend! Kemper’s Soul & Caribbean Food – yummy! Cash Mob social hour Friday from 7pm-9pm – come get your “I Love Intown SW ATL” sticker! Neighborhood with biggest turn out gets the trophy! We will also be giving out the remainder of our FREE Braves tickets for Sunday night’s game. 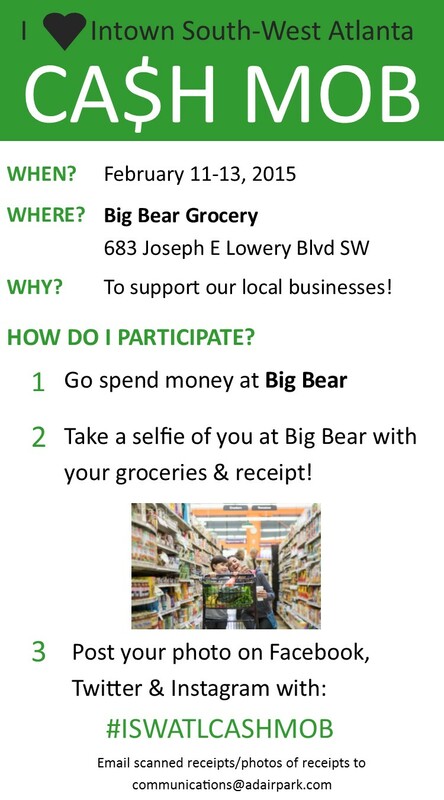 Help us support our local businesses by shopping around intown South-west Atlanta! In partnership with Pittsburgh, Sylvan Hills, Capitol View, Capitol View Manner, Mechanicsville, West End, Westview, & Castleberry Hill, we are holding a CA$H MOB to get folks out to the Big Bear this weekend! Why: To support local business! If you have never been, this event is awesome, and within the borders of Adair Park just north of Ralph David Abernathy. If you are in the need for some furniture, art, knick-knacks or other types of antiques, check out the auction held the 2nd Friday of every month at 556 Tift Street. June’s auction is this Friday, March 7th at 6:30pm. Food and drinks are provided, 15% buyer’s premium, APD officer on duty for parking and security, and lots of great items up for auction. This month’s auction website is here, and features pictures of some of the items up for sale. There are always quite a few Adair Park neighbors there and we always have a good time. This auction gets a lot of love from Adair Park! You can also view and/or like their Facebook page. Multi-family yard sale on Saturday, March 8th at 9am! As the winter cold thaws and sunshine comes in, Adair Park families do some spring cleaning and have organized a yard sale! More details to come, but the majority of the items for sale will be in Adair Park One on Mayland Avenue near the intersection with Catherine Street. We hope to see you there! Check the Adair Park Neighbors Facebook page for more information. Atlanta Antique Auction this Friday! If you have never been, this event is awesome, and within the borders of Adair Park just north of Ralph David Abernathy. If you are in the need for some furniture, art, knick-knacks or other types of antiques, check out the auction held the 2nd Friday of every month at 556 Tift Street. June’s auction is this Friday, June 7th at 6:30pm.